The ‘Global South’ is a terrible term. Don’t use it! The ‘Global South‘ and ‘Global North‘ are increasingly popular terms used to categorize the countries of the world. According to Wikipedia, the term ‘Global South’ originated in postcolonial studies, and was first used in 1969. The Google N-gram chart below shows the rise of the ‘Global South’ term from 1980 till 2008, but the rise is even more impressive afterwards. Nowadays, the Global South is used as a shortcut to anything from poor and less-developed to oppressed and powerless. Despite this vagueness, the term is prominent in serious academic publications, and it even features in the names of otherwise reputable institutions. But, its popularity notwithstanding, the ‘Global South’ is a terrible term. Here is why. The Global South/Global North terms are inaccurate and misleading. First, they are descriptively inaccurate, even when they refer to general notions such as (economic) development. Second, they are homogenizing, obscuring important differences between countries supposedly part of the Global South and North groups. In this respect, these terms are no better than alternatives that they are trying to replace, such as ‘the West‘ or the ‘Third World‘. Third, the Global South/Global North terms imply a geographic determinism that is wrong and demotivational. Poor countries are not doomed to be poor, because they happen to be in the South, and their geographic position is not a verdict on their developmental prospects. Let me show you just how bad these terms are. I focus on human development, broadly defined and measured by the United Nations’ Human Development Index (HDI). The HDI tracks life expectancy, education, and standard of living, so it captures more than purely economic aspects of development. The chart below plots the geographic latitude of a country’ capital against the country’s HDI score for 2017. (Click on the image for a larger size or download a higher resolution pdf). 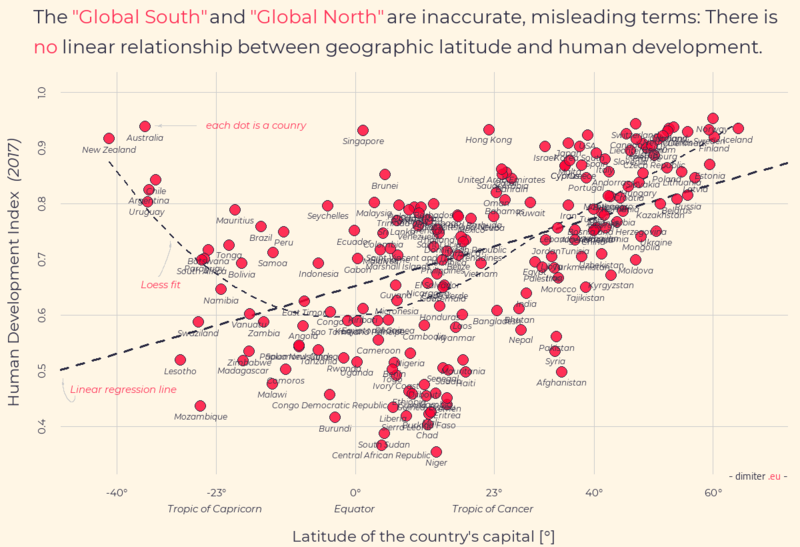 It is quite clear that a straight line from South to North is a poor description of the relationship between geographic latitude and human development. The correlation between the two is 0.48. A linear regression of HDI on latitude returns a positive coefficient, and the R-squared as 0.23. But, as is obvious from the plot, the relationship is not linear. In fact, some of the southern-most countries on the planet, such as Australia and New Zealand, but also Chile and Argentina, are in the top ranks of human development. The best summary of the relationship between HDI and latitude is curvilinear, as indicated by the Loess (nonparametric local regression) fit. You can say that we always knew that and the Global South was meant to refer to ‘distance from the equator’ rather than to absolute latitude. But, first, this is rather offensive to people in New Zealand, Australia, South Africa and the southern part of South America. 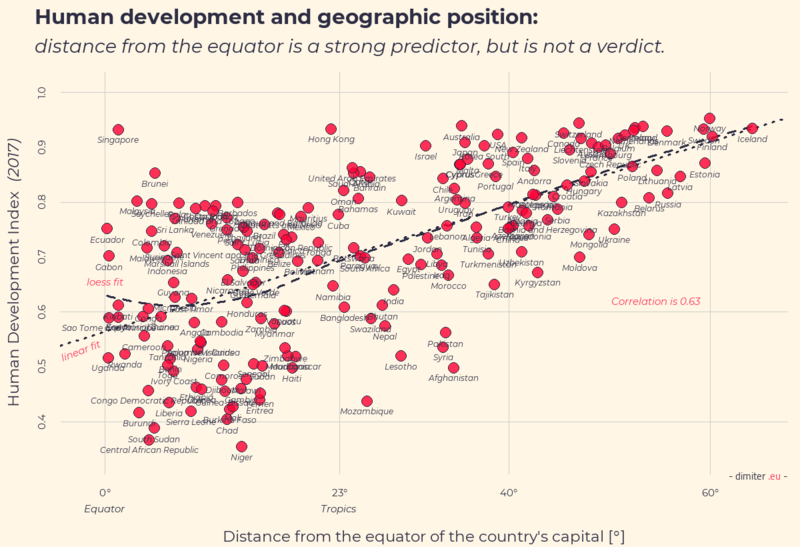 And, second, there is still far from a deterministic relationship between human development and geographic position, as measured by distance from the equator. The next plot (click on the image for a larger size, download a pdf version here) shows exactly that. Now, overall, the relationship is stronger: the correlation is 0.64. And after around the 10th degree, it is also rather linear, as indicated by the match between the linear regression line and the Loess fit. Still, there is important heterogeneity within the South/close to equator and North/far from equator countries. Singapore’ HDI is almost as high as that of Sweden, despite the two being on the opposite ends of the geographic scale. Ecuador’s HDI is just above Ukraine’s, although the former is more than 50 degree closer to the equator than then latter. Gabon’s HDI is higher than Moldova’s, despite Gabon being 46 degrees further south than Moldova. This is not to deny that there is a link between geographic position and human development. By the standards of social science, this is a rather strong correlation and fairly smooth relationship. It is remarkable that no country more the 35 degrees from the equator has an HDI lower than 0.65 (but this excludes North Korea, for which there is no HDI data provided by the UN). But there is still important diversity in human development at different geographic zones. Moreover, the correlation between geographic position and development need to be causal, let alone deterministic. There are good arguments to be made that geography shapes and constraints the economic and social development of nations. My personal favorite is Jared Diamond’s idea that Eurasia’s continental spread along an East-West axis made it easier for food innovations and agricultural technology to diffuse, compared to America’s continental spread along a North-South axis. But geography is not a verdict for development, as plenty of nations have demonstrated. Yet, the Global South/Global North categories suggest otherwise. OK, so the Global South/Global North are bad words, but what to use instead? There is no obvious substitute that is more descriptively accurate, less homogenizing and less suggestive of (geographic) determinism. But then don’t use any categorization that is so general and coarse. 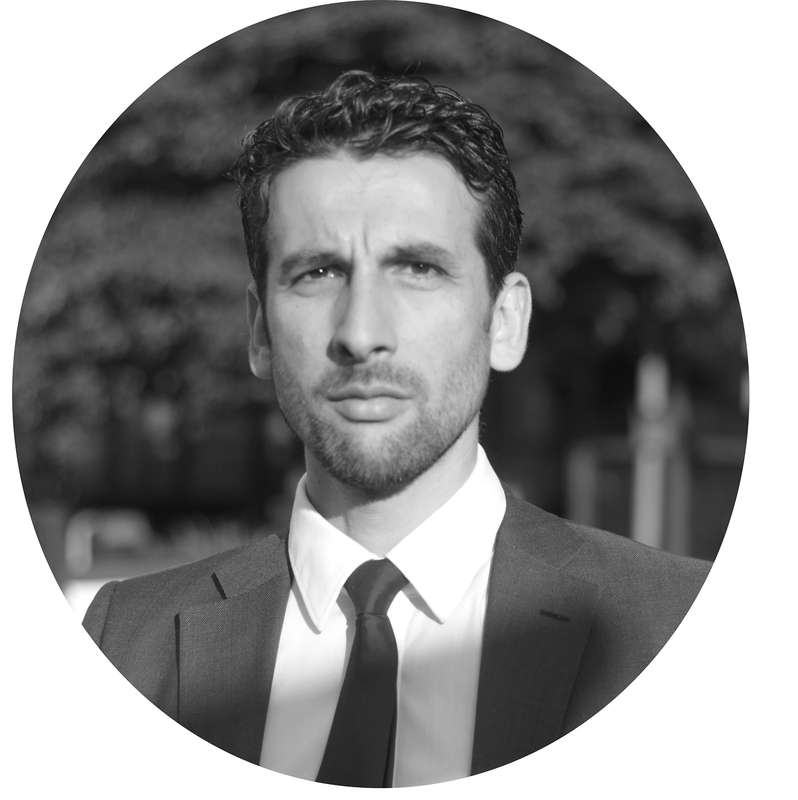 There is a good reason why there is no appropriate alternative term: the countries of the world are too diverse to fit into two boxes: one for South and one for North, one for developed and one for non-developed, one for powerful, and one for oppressed. Be specific about what the term is referring to, and be concrete about the set of countries that is covered. If you mean the 20 poorest countries in the world, say the 20 poor countries in the world, not countries of the Global South. If you mean technologically underdeveloped countries, say that and not countries of the Third World. If you mean rich, former colonial powers from Western Europe, say that and not the Global North. It takes a few more words, but it is more accurate and less misleading. It is a bit ironic that the Global South/Global North terms are most popular among scholars and activists who are extremely sensitive about the power of words to shape public discourses, homogenize diverse populations, and support narratives that take a life of their own, influencing politics and public policy. If that’s the case, it makes it even more imperative to avoid terms that are inaccurate, homogenizing and misleading on a global scale. If you want to look at the data yourself, the R script for the figures is here and the datafile is here. It’s a metaphor. Nobody believed the Iron Curtain was either a curtain or made of iron. Let alone that this would have been a case of home-decorative determinism. Metaphors are not neutral. They suggest associations, evoke emotions and help produce meaning. The ‘Iron Curtain’ suggested an impenetrable barrier between Eastern and Western Europe, and the expression evokes the closing of the curtain on the world stage.